Oral cancer occurs when cells are found on the lips, tongue, gums, inner lining of the mouth, jaw or upper throat area. Oral cancer screenings help to eliminate the risks of developing a more serious oral health condition. Carcinogens found in tobacco products, alcohol and certain foods, as well as excessive exposure to the sun, have proven an increase risk of developing oral cancer. Inflammation due to chronic periodontal disease quadruples your risk of developing Alzheimer’s. Bacteria found in oral cavities can enter the blood stream after invasive dental treatments, causing bacteria to enter the brain regularly. This bacteria can potentially trigger immune system responses, causing the release of chemicals that can kill neurons. Research shows that women who have periodontal disease have an increased risk of delivering a pre-term baby with a low birth weight. Gum infections stem from fluctuating hormone levels that come with pregnancy. Pregnant women who are also diabetic are more prone to gum inflammation and more severe gum disease. 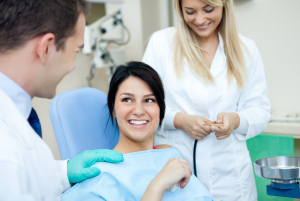 Visiting a dentist regularly can help you maintain your oral health and overall health. By taking good care of your teeth and treating any dental problems that may occur, you can keep your mouth healthy and contribute to your overall health.